Whether you are looking to enter your first open water event or take on the ultimate swimmers’ marathon, the Dock2Dock Race offers a range of distances to suit all abilities. London’s unique and historic waters offer an unforgettable opportunity to compete in the open water in the heart of the vibrant East End. The 10k & 5k event start in Royal Victoria Dock and take you through Royal Albert Dock and back into Royal Victoria Dock. The 10k Race is 2 laps of the swim course and the 5k is one lap. The 1500m event will take place in Royal Victoria Dock. The Dock to Dock Race will operate using the NOWCA safety system offering all competitors a safe and enjoyable race and will be managed by our team at Love Sports Events offering many years of highly successful sports events experience. 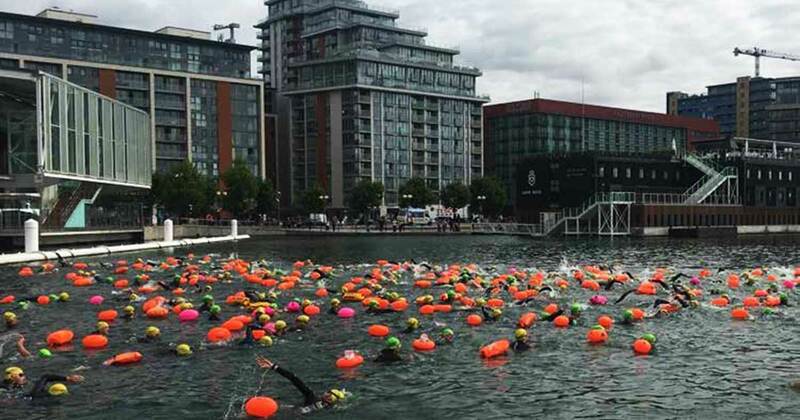 Love Sports Events are proud to work with London Royal Docks Open Water Swimming to host this iconic swim race in the heart of London for the 4th consecutive year. Please be aware – this event is a challenging swim & is not suitable for inexperienced swimmers. By selecting Royal London Docks OWS as your venue on the NOWCA system, you can collect your band, prior to the event, if you choose to train during our regular open water sessions, follow the link here for opening times. Alternatively your band will be available to pick up at registration, along with tow floats, on event day. Safety is of paramount importance for our event and therefore it is compulsory for all swimmers to wear a Tow Float in the 10k & 5k event. Tow floats are optional for those swimming in the 1500m event, other than the 12-16 age category. Tow floats that have been purchased with entry will be available to pick up near registration on the morning however we do recommend you train with your tow float before the event and therefore you can arrange to pick this up when you practice during our regular sessions – see website. All competitors must swim with a tow float during the race. Anyone without one will be asked to leave the water. Wetsuits are OPTIONAL for the Dock2Dock event other than the 12-16 category in the 1500m event in which they are COMPULSORY.